This Tuscan tapestry "Iris Fields" shows a gorgeous field of irises in the Tuscan hills, the work of artist Marcelo Silva. His mastery of the use of light and color in his works depicting Tuscan scenes is his signature. In this Tuscan tapestry, we see the Tuscan landscape in an exceptionally beautiful light and color. The purples of the irises complement the earth tones and orange tones in the rest of the scene. The many variations of greens complement each other beautifully. There is a subtle use fo light that is exceptional in this piece to create the effect a soft light which shows the impressionistic rendition of his irises, trees, village and distant poplars perfectly. The Tuscan landscape in Italy is renowned for its beauty and this work of Silva reflects this natural beauty most wonderfully. 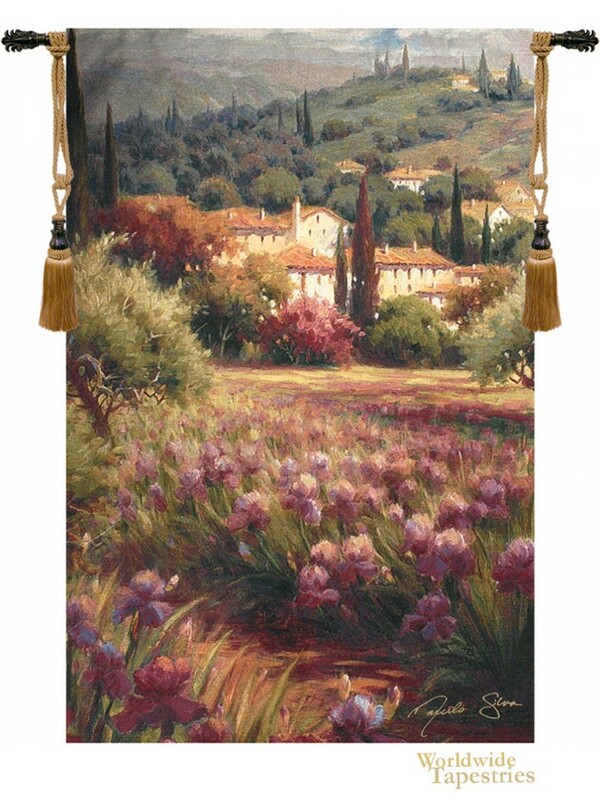 This Tuscan tapestry "Iris Fields" is backed with a lining and has a tunnel for easy hanging. Note: tapestry rod and tassels, where pictured, are purchased separately. Dimensions: W 47" x H 70"